I think it’s a shame that Korean food in the Singapore food scene isn’t as strong as its Japanese counterpart. 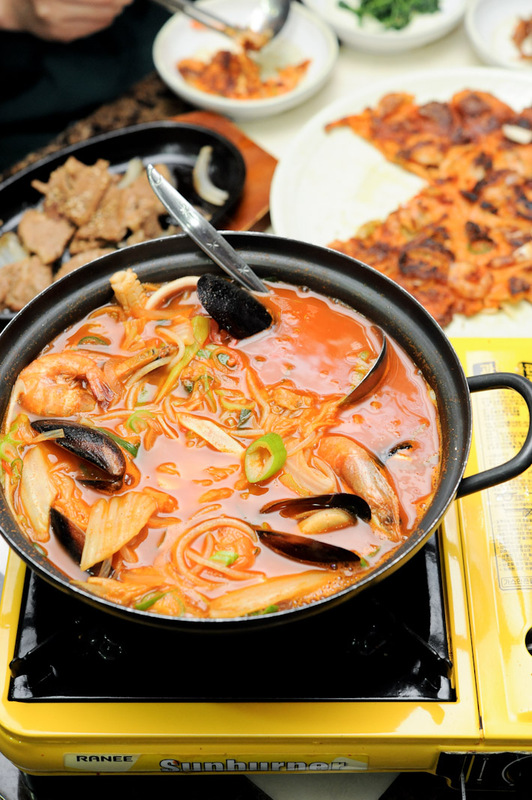 For those of you who have been craving for Korean Food, I know exactly how you feel. Sometimes, it’s quite frustrating not knowing where to go for good Korean Food even though we have quite a few Korean Restaurants in Singapore. I’m currently on a hunt for the best Korean Fried Chicken in Singapore, and I also want to try a few Korean BBQ Restaurant. I am going to round up a few friends for a Korean BBQ Buffet and have a crazy night of eating. Okay, one of my new year resolutions is to eat more Korean food – bibimbap, Korean Ginseng Chicken, kimchi and pancake, here we come! 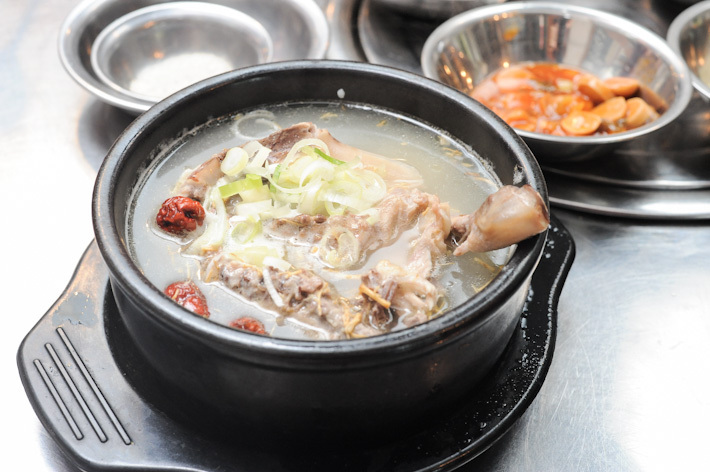 While it is relatively easy to find Korean restaurants in Singapore, it is difficult to find a truly outstanding place that will make you go back again and again to try everything else on the menu that you have not tried. 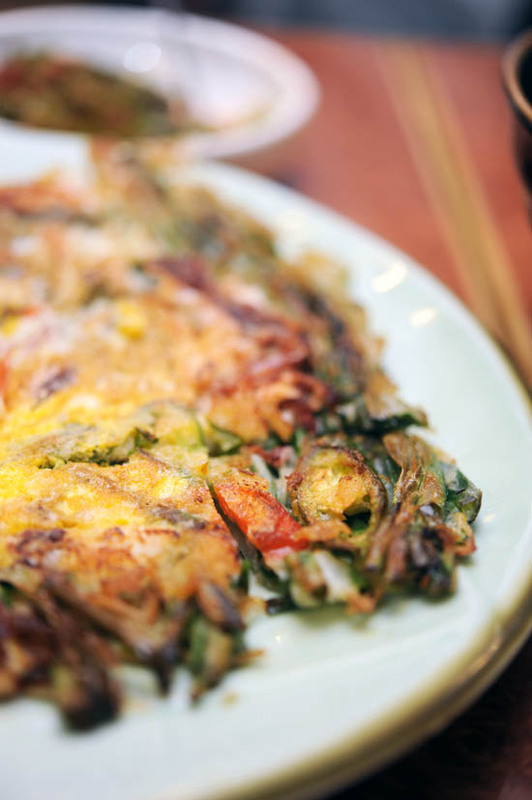 Big Mama Korean Restaurant at Kim Tian Road is one of the few that belongs to this category. The food is generally good, and addictive enough to make you return on a regular basis. This new Korean restaurant at Link Hotel belongs to the same owner of Kko Kko Nara Korean restaurant. 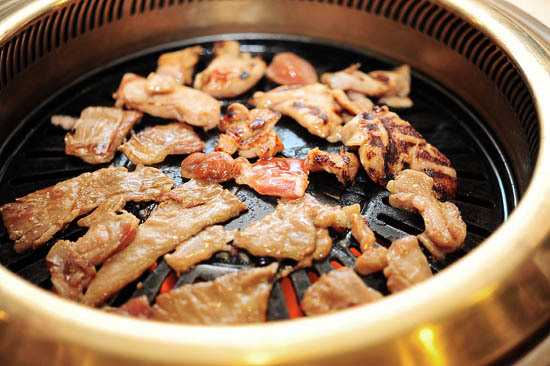 The Korean BBQ buffet is priced at S$19.90/pax for lunch and S$26.90/pax for dinner. Most people are not very adventurous when it comes to food, so I can understand that they prefer to go to somewhere reliable, and Crystal Jade is evidently one of them. We went to Crystal Jade Korean Restaurant at Ngee Ann City for their Korean BBQ recently, and the food was surprisingly good and affordable. 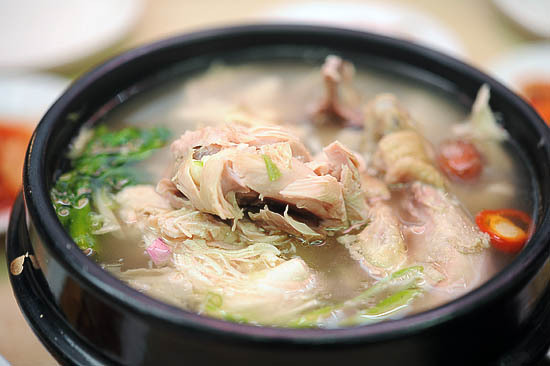 Another must-order dish includes the Korean Ginseng Chicken Soup. Tucked away in the basement of Bukit Timah Shopping Centre is Ga Ya Geum, a Korean family restaurant. The versatile menu makes it a great place for a family meal or a dinner place with friends. There is also a lunch set menu for those who work around the area. Jang Shou Korean Restaurant at Katong Village serves a decent Korean BBQ Buffet (with a spread of 15 items) and they only open during dinner. The weekday Korean BBQ Buffet is S$28.80++/pax, while the weekend Korean BBQ Buffet is S$33.80++/pax. For those who prefer to order ala carte, go to the outlet at Esplanade Mall. 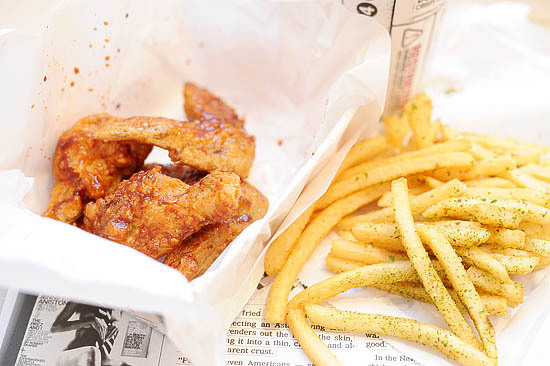 4 Fingers Bonchon is a fastfood restaurant at the basement of Ion Orchard that serves the famous Korean Fried Chicken. Trust me, you can easily have a dozen chicken wings on your own – they are that addictive! 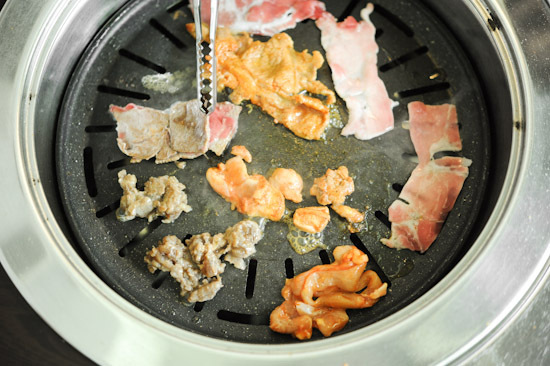 The Korean BBQ Buffet at Ju Shin Jung Korean BBQ Restaurant is available at S$29++/pax during lunch daily. For dinner, the buffet is only available from Monday to Thursday. For cheap and good Korean food in Singapore, Kim Dae Mun Korean Cuisine, a stall at the basement food court at Concorde Hotel is the place to head to. Prices range from S$4.50 – S$7.50. My favourite Korean restaurant in Singapore. One of the reasons why I love Kim’s Family Restaurant is because they serve ten banchan (side dishes). The food here is authentic, reasonably affordable and very delicious. Kko Kko Nara Korean Restaurant on Tras Street (Tanjong Pagar) is a mom-and-pop chicken place that has been around for a while. It is one of my favourite to-go places for Korean Fried Chicken. And if you are looking for a place for supper, Kko Kko Nara opens till late night 4am. Frequented mostly by Korean students, Ming Jia Korean Food – a small kiosk at the basement of Bukit Timah Plaza – is another place where you can go for cheap and good Korean food. With close to 680 restaurants in Korea and across Asia in China, Japan, Nolboo Hangari Galbi at Orchard Central is the first of the Korean restaurant chain’s BBQ outlets in Singapore. Red Pig Korean Restaurant is one of the most popular Korean places in the Central Business District. If you are working in the area, go there for lunch – most of the set lunches are only S$10. For dinner, prices are considerately steeper, but there is a reason why people always go back for the Korean BBQ. Located at Orchard Central (level 7), Sarang prides itself as a Korean bistro, and it has recently introduced a Korean-style tapas menu which features classic favourites and modern Korean-fusion dishes. Judging by the crowd on a weekday dinner, Togi Korean Restaurant is definitely one of the more popular places for Korean cuisine. I’ll probably go back again for their Korean BBQ. Another place that you can go on Amoy Street is Wang Dae Bak Korean Restaurant, which specialises in Korean BBQ. During lunch, they have very good set lunches and we would recommend the Korean Ginseng Chicken Soup (S$10), which is a steal for the price. Another place that has really good Korean fried chicken is Woori Nara Korean Restaurant at Lorong Kilat. 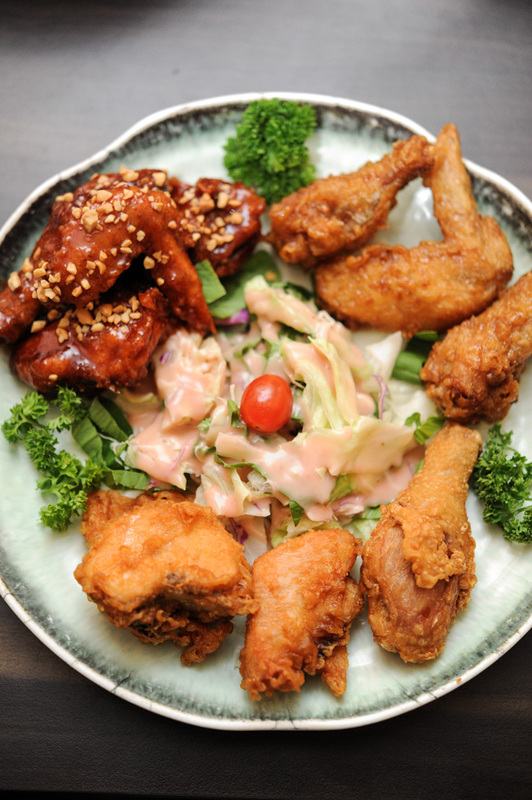 They have four different flavours – original, signature in-house sauce, soy and garlic – for the Korean fried chicken. You can also find popular Korean classic dishes such as Grilled Pork Belly (S$35), Stone Pot Bibimbap (S$17), and Seafood & Kimchi Pancake (S$15). Boss bbq arty Clarke quay. Best chicken ever! Recently I found a place that sells yummylicious korean fried chicken! Definitely on par or even better than 4fingers! There’s a dish that they used the bulgogi sauce to marinate and it tastes wonderful! Another to try dish will be their fries, which they call it buffalo sticks. Pretty interesting name and initially i even thought it was chicken. It’s so nice and I dont think you can find fries that taste this awesome anywhere else in singapore. A restaurant opened by authentic koreans and the food there taste as though I am in Korea! However, I would advise you to avoid lunchtime hours as there’s many korean expatriates there during lunch time. Guess it’s because they do actually serve korean food that tastes alike to Korea instead of some replica in singapore. I would recommend their seafood pancake and beef stew! Their bossam is a must try too! I like this reviews on korean restaurants in singapore. I personally visited the Star Vista Branch (Borgna) pretty awesome Korean BBQ with variety of Veggie, and my most visited one Kim’s family korean restaurants along Lorong Kilat. My korean friends say that Todamgol in tanjong pagar was one of the better ones they’ve tried! I really like Manbok Galbi BBQ on Tanjong Pagar Road, they are very reasonable and serve up quiet a few bottomless side dishes. Unfortunately they are currently undergoing renovations. Enjoy. My Korean girlfriend, my Korean housemate, my Korean teacher and many of our Korean friends and colleagues seem to agree that Dae Bak Korean BBQ restaurants at Amoy St and China Square Central are some of the best. Also our favourite Korean Chicken restaurant is Chicken Up. Seriously better than Kko Kko Nara or Nene. Try their soy chicken and yangnyum chicken. Brought my whole family for a dinner for my mum’s bday @ Kim’s (lorong kilat), oct 2012. Their standard dropped so seriously that i think i am never going back. I think i went to Kim’s 2 years back and i really thought their food was nice. that is why i brought my family there to eat. One example: the tofu chigae was the first thing i love about kim’s. 2 years later, they actually throw in one long piece of japanese tofu (those u see in NTUC). first thing, for the price i actually paid for it, it tasted cheapskate. second thing, they dun even bother to cut the tofu to slices. Compare to it Koryo @ fushion easily taste much better and cheaper. My favorite shiu Yakiniku But it japanese BBQ Buffet Restaurant on The Village opposite Jurong Bird Park. It really reasonable. especially the home make teriyaki sauce there!!shiok!!! Go try it!! Yum yum!!! Recently made an order with The Korea Food Company for a sumptuous feast we had this evening. My family enjoyed very much. We like most – the marinated Bulgogi Pork and L.A. Kalbi beef. 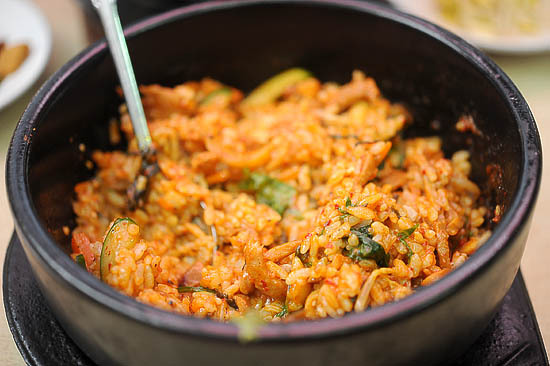 The Bibimbap cannot be missed. That’s very nutritious and healthy (since recently Singapore HPB has been promoting healthy eating habits). 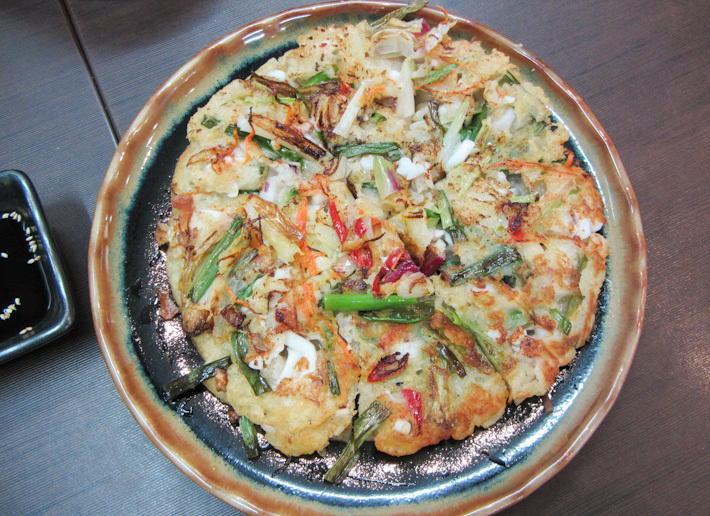 The pancake tastes excellent when it is pan-fried – very crispy. After living for last 2 yrs in the Land of Morning Calm and fantastic food outing, I would not go near Kim Dae Mun. Cheap but seriously a bad reflection of KRean food. Maybe it has been localised. Went to Big Mama in Tiong Bahru with Korean colleague. Soup dishes too watery, kimchi overtly salty and our conclusion is NEXT. Togi restaurant had dropped their food standard. Was impressed with their service and taste years back. Somehow, overwhelming by crowd and therefore they had lost their quality in food. Kimchi soup was tasteless and all the sidedishes taste localized like those you may found in those Korean stall in food court (dry and not fresh). BBQ pork was hard and cold. Btw, FYI we dine in during weekday evening for dinner. Boss lady was there but somehow the quality of food was really disappointed. Todamgol at Tanjong Pagar. Must go. Kimchi is the closest I found to the korean homemade ones. Go during dinner and you will feel like you are watching korean drama without sub-titles. Nolboo Hangari Galbi at Orchard Central is really good too! I am guessing its authentic as I was served by Korean. Service generally quite good!